Fuerteventura is roughly 1600 square kilometres in size, making it the second largest island in the Canaries. The most easterly of the group and located only 90 kilometres from Morocco, this popular island attracts thousands of visitors throughout the year. 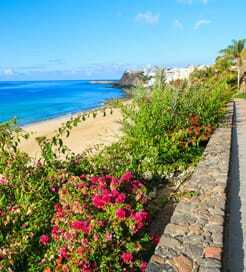 Getting around the Canary Islands by ferry in general is relatively simple and Fuerteventura itself is reachable directly from neighbouring Lanzarote, Gran Canaria and Tenerife. 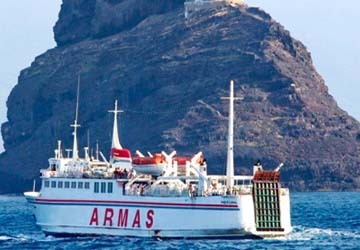 The island is served by the most popular ferry companies in the region including Fred Olsen and Naviera Armas who operate many crossings each day. If you don’t arrive by car and don’t fancy hiring then no problem, getting out and about is still easy. Many people hire a bicycle as Fuerteventura is known as being an ideal place for road or mountain cycling due to its landscape and climate. All types of bicycle can be hired, including mountain bikes, professional road bikes, trekking cycles and children's bikes. If that sounds too energetic for you, the local buses come recommended and are used by both visitors and locals as they are very reliable and cheap too. There’s a good choice of golf courses to try at Fuerteventura too ranging from a challenging venue in Costa Caleta to a 9 hole course in Corralejo.